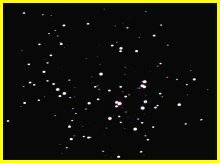 M44 the Beehive Cluster, or Praesepe is visible to the unaided eye in Cancer. It is best viewed in binoculars and many of the brighter stars form pairs. In May 1993 Mars passed by the edge of M44, and in June 2002 Jupiter did the same.